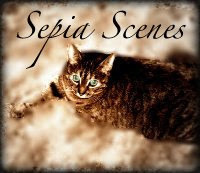 Mo at Purrchance to Dream has created this wonderful new Sepia Scenes badge for anyone who would like to use it on their Sepia Scenes post. As a cat lover this is very appealing. Nice job Mo. Oh, I love this cat! I'll have to think of a good photo for sepia just so I can download this cute kitty for my blog. Maybe next week. I found a window for this week.